This marker is was good overall. I got one in Neon Pink. Flowed well. Vibrant. Opaque. 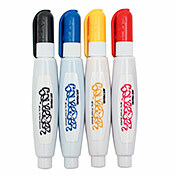 Better paint formula than the Krink k-12 or any correction pen. A problem I had was after using it over the course of about a week, The marker streaked so bad mid tag that it wouldn't show. Shaking it, I could still tell there was a fair amount of paint in the marker. Looking at it closely, it looked like the metal tip ball fell out. Not sure if it had anything to do with the Xylene, As my past experience with xylene based ink and paint has dried plastic mops and nibs before. I'm not sure though because I don't see how Xylene could screw up a metal ball. But still a good marker overall. I'm planning on ordering many more in the future in different colors. Hopefully this won't happen again. (APREPLY) I'm sure the plastic barrel is fine right? If that's the case then I can assure you the tip is still there and works. There is no metal ball in this marker. It's a steel needle type tip. Most likely you just got a little dried paint in there. Easy fix. I clean my metal tips (and this works for a lot of nibs) by putting the head in a glass jar filled with the appropriate solvent. What is the apropriate solvent? Well that depends on whats in your marker. In this case just use some paint thinner. Now shake it to clean it. Remove from jar, shake off the excess, put it back on and you are good. This might take 1/-3 tries. Its usually once though.